Dear friends and followers of Perfume Polytechnic, I don’t know what the year has been like for you, but 2014 has been a big year for me. I moved from Australia’s second-largest city to a rural town with a population of 1,600, celebrated a mile-stone birthday, learnt many valuable life lessons, and started this blog. In the three months that Perfume Polytechnic has been running, I have learned so much about fragrance and how we smell, and I hope you’ve also enjoyed my verbose posts and the information I’ve shared with you. Thank you to all of my readers for helping put Perfume Polytechnic on the map. It’s taken a lot of hard work to get things up and running, and I’ve thoroughly enjoyed the challenge. At nearly 2,000 views over three months, I’m very happy with how things are going, but I have to thank all of you for that: for visiting, commenting, and supporting me in this venture. Thank you. Merry Christmas and a Happy New Year to those of you who celebrate these holidays. I look forward to continuing the Perfume Polytechnic journey with you all next year. 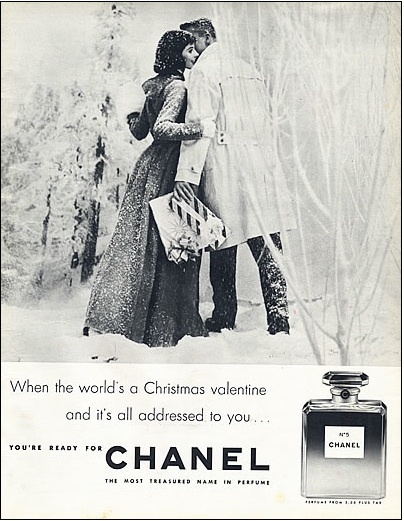 To say adieu to 2014 and to celebrate Perfume Polytechnic’s first Christmas online, I’d like to share with you some vintage, Christmas-themed perfume ads. Let’s take a look together at how perfume was promoted, and what it meant historically to people, in decades past. 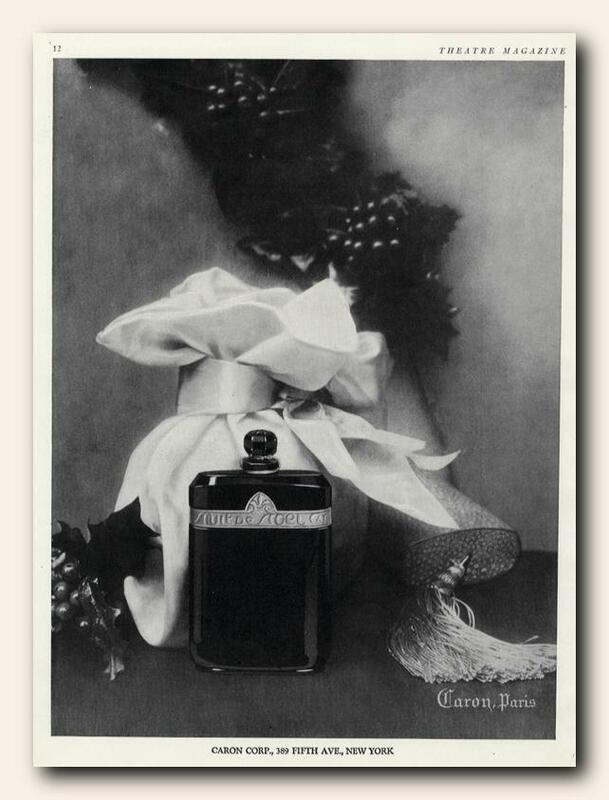 Caron’s Nuit de Noel, ad from 1928. What could be more Christmassy that Caron’s classic, Nuit de Noel? I adore this fragrance, and the sublimely stylish art deco bottle is still in production today, proving just how popular it is. A perfume made by Colgate? 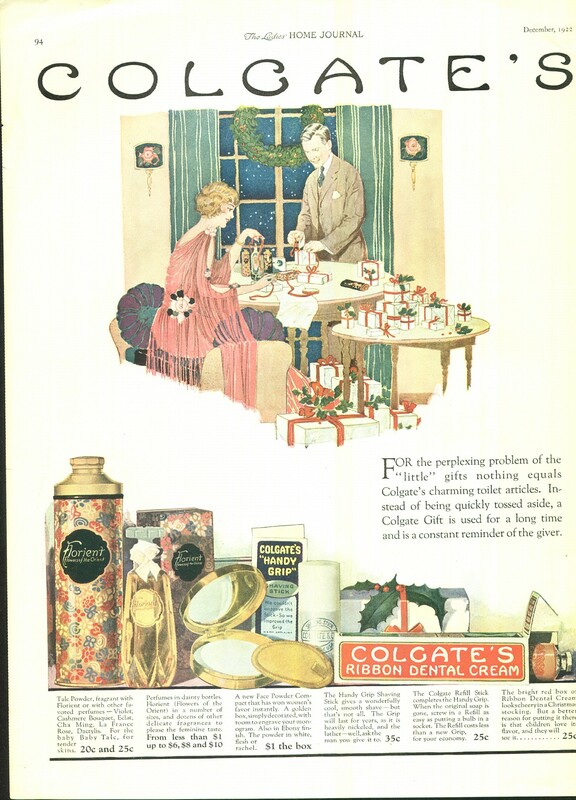 I don’t know if this surprises you as much as it does me, but while ferreting around online this evening for vintage ads, I discovered this 1922 advertisement for Colgate, featuring toothpaste, a shaving stick, and… perfume! The ad claims: “Instead of being quickly tossed aside, a Colgate Gift is used for a long time, and is a constant reminder of the giver.” Maybe I’ll start giving toothpaste as gifts? 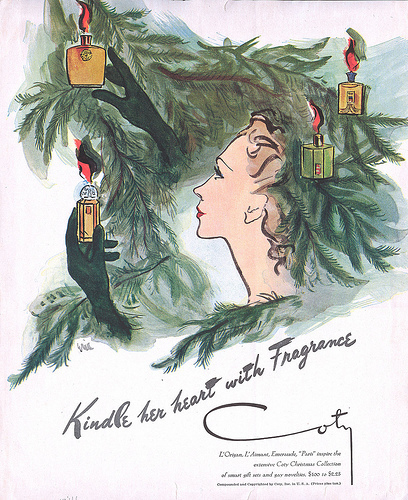 This gorgeous Coty ad shows a range of fragrances adorning a Christmas tree, and the slogan “Kindle her heart with Fragrance.” I know I’d be pretty excited too if someone special adorned my tree with fragrances. Hint, hint, Olly Technic. Oh, and I’d be happy if they were vintage Coty too. 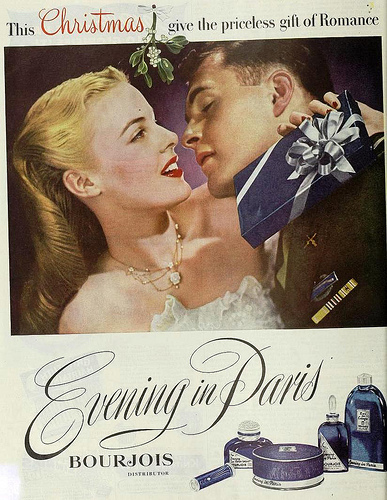 I’m guessing from the woman’s sculptural hair and the man’s military outfit that this is a war-time advertisement. Is it just me who thinks she looks a little wary as her man leans in, eyes closed, for a romantic kiss? Maybe she wanted something from Chanel instead? Aha! Perhaps I was right? The woman in this ad looks much happier than our Bourjois lass above, after being given the classic Chanel fragrance, No. 5. “When the world’s a Christmas valentine and it’s all addressed to you… You’re ready for Chanel.” I can hear Don Draper uttering those words. 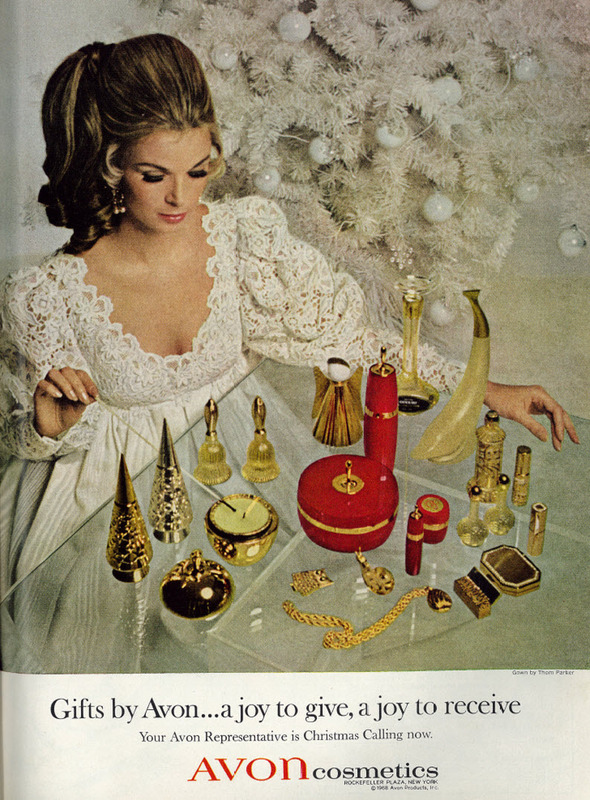 Avon: sharing the Christmas joy in 1968. Avon has always been reliably affordable, and they make great novelty fragrance bottles. This lucky lady seems to have a whole table-full of fragrant gifts for Christmas. Good thing they didn’t cost too much. There’s nothing I love more than a kitsch photo or illustration from the 1950s that makes women look just plain silly! 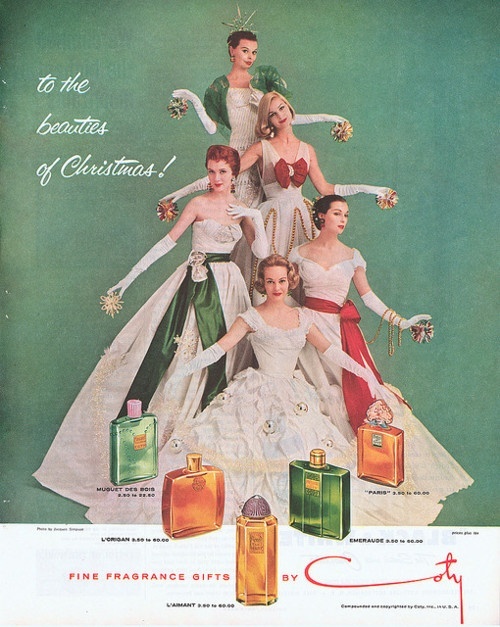 Here we have a group of young, gorgeous debutantes, who form the shape of a Christmas tree. They are the tree and its decorations all at once! They are “the beauties of Christmas”!